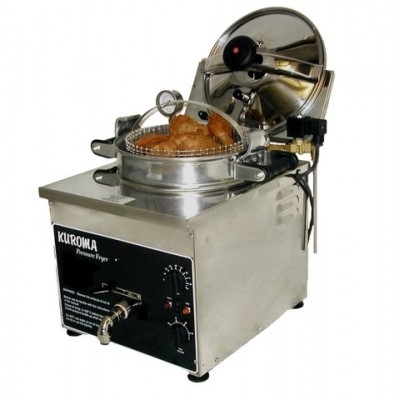 It cooks in exactly the same way as the expensive Southern Fried Chicken fryers, so the results are just as good, but sized and priced to suit the traditional British fish-and-chip shop. Being low cost it usually pays for itself in a just a few weeks. It does not need a heavy duty power supply. This means that it is portable and can be used wherever there is a normal 13 amp socket. The heaters are outside the pot so that the inside surface is unobstructed and therefore relatively easy to clean. It is easy to use, fast, safe, and a great potential profit earner. The lid is held closed by a spring clamp bar, so that even if all the pressure regulating devices fail, the lid lifts slightly to relieve excess pressure. Above all else, when used correctly , the taste of the fried chicken is excellent. All the equipment on the website is on showcase at our SHOWROOM so come and visit to see and feel the equipment you are purchasing. 220/240 volts, 3 kW, 50 Hz (other supplies on request). Size 500 mm front to back x 350 wide x 450 high. Pot capacity 15 litres. Thermostatic temperature control, dead weight pressure control, electromechanical timer. Comprehensive 12 month guarantee. ASTONS is Europe’s premier internet supplier of catering equipment offering 24 hour free quotes, orders and payments for kitchen/fast food equipment supplies to all clients including trade and general public. We repair most catering equipment, we specialise in kebab machines, peelers, chippers, knives, pressure fryer repairs and many more. Please check our Repairs page for more information. © 2019 Astons General Commercial Appliance Sales & Repa.